EXPERIENCED Port Adelaide defender Hamish Hartlett is on track to return from a serious knee injury in time for the start of next season. The 28-year-old played the first five rounds of the 2018 campaign before tearing the ACL in his right knee in a training drill on April 26. Hartlett, who has played 153 games with the Power since being taken with the No.4 pick in the 2008 NAB AFL Draft, has been running laps during pre-season training and will increase his training loads early next year. He expects he will return to full training as early as the end of January. "I'm about seven and a half months into my rehab from my ACL injury," Hartlett told Channel Ten. "I've still got about another three, three and a half months to go, but hopefully late January, early February I'll be out on the track and doing all the stuff with the boys." That timeline would have Hartlett potentially in line to play the Power's first JLT Community Series game against Adelaide at Port Pirie on March 2. Port finishes its pre-season hosting North Melbourne at Alberton Oval on March 9, before taking on Melbourne at the MCG in round one of the season proper on March 23. Hartlett had a strong start to last season before the torn ACL put a premature end to his year. He averaged 14.2 kicks and 7.8 marks per game – the highest in those categories in his 10 seasons in the League – to go with 19.6 disposals and three Inside 50s. It was his second year playing across half-back after shifting from the midfield at the start of 2017. Hartlett, who is in the Power's leadership group, is among the candidates to be the club's new captain after skipper Travis Boak last week stood down after six years in charge. 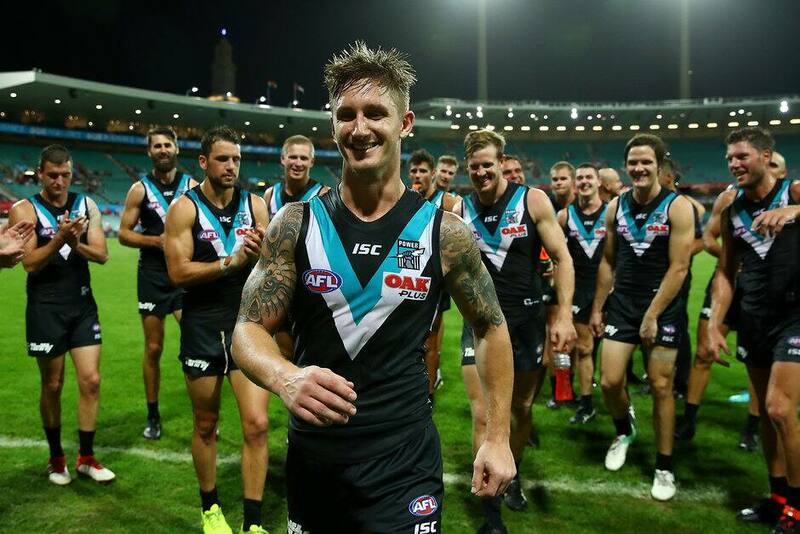 Vice-captain Ollie Wines and defender Tom Jonas are the frontrunners for the position, but Hartlett said they wouldn't be the only ones in consideration. "We've got several guys who are more than capable and worthy of wearing that No.1 guernsey," he said. "It's very, very hard to pick one at this point in time, so we'll let that play out over the next two or three months, then the decision will be made closer to the start of the season."